This is a distinction worth knowing about. They look pretty similar. They can do some of the same things. But, one is very easy to override and the other is not. Inline styles on an HTML element. 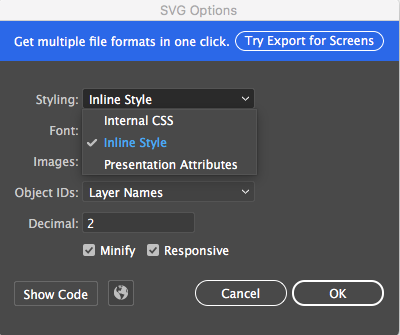 Inline styles on an SVG element. Presentational attributes on an SVG element. Any CSS at all will do. It also makes good sense to add presentational attributes, especially sizing ones, to SVG to avoid FOUSVG. I believe the value of the width and height attributes should be unit-less. For SVG width/height presentation attributes, you can either use unitless numbers (treated as px) or any valid CSS unit or percents. 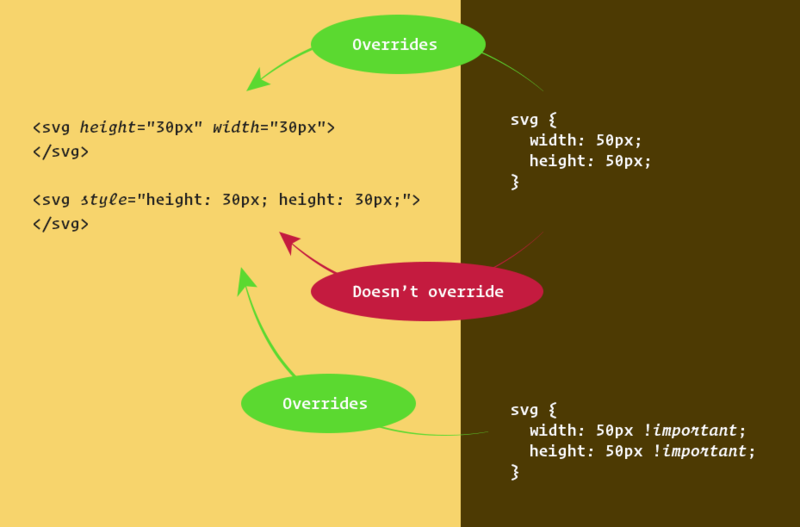 This is consistent with presentation attributes in SVG just being another way of setting the style property. For HTML width/height presentation attributes on <img>, <object> and so on, you can only use unitless numbers. <svg width="300" height="300"> and <svg width="300px" height="300px"> are give the same result. It is valid either way. Without units it’s only static values but with units you can use percentage widths too. in <img> tag unit or unitless numbers for width and height both are working fine.. It “works” because browsers know how to “recover” from this type of error. <image> works too but it does not mean that’s what we should be using. Actually, it is because authors make this type of mistakes that browsers have to support such markup.